Leo Bonten sits in the glow of his new lamp ... made with his own amputated leg. 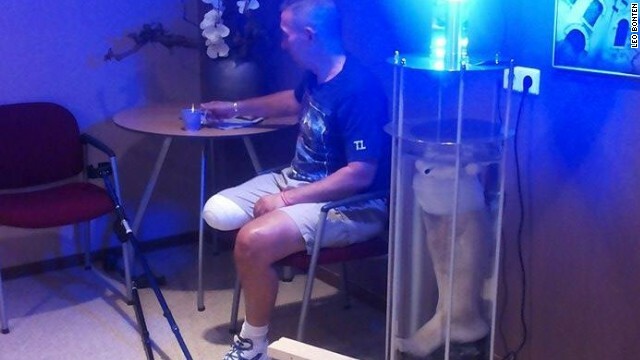 (CNN) -- It took a lot of effort for Leo Bonten to turn his amputated leg into a fully functional lamp. For starters, he had to break the damn thing in a freak kiddie pool accident. Seriously. That's how it all started, thus confirming what I've always said: "Kiddie pools are not toys, and should only be used as giant, outdoor toilets." I chose that as my high school yearbook quote over "Carpe diem." But it really happened. In July 2012, the unfortunate Dutchman suffered a terrible break while goofing off with his cousin in south Rotterdam. Over time, the leg became infected, ignored, and more infected to the point where, in July of this year, doctors had to remove it surgically. So, Bonten, now 53, settled in to the fact that he would be losing his right leg -- a harsh reality for an otherwise healthy and active man. But it was damaged beyond repair, and there was nothing he could do. Except, you know, maybe ask to keep it. "It's my leg," he told me over the phone. "It's my legal right." Sort of. We'll get to that. Either way, he asked for it, which I'm sure lead to a rather awkward, if not spirited, conversation with hospital administrators. "Sir, we just can't give it to you." "Right. Well, what if I bring in my own tin foil?" Generally speaking, hospitals use very specific protocol with amputations. For safety and sanitation reasons, they're usually required to incinerate them. Body parts can also be buried during some sort of official funeral (and, perhaps, exhumed) with proper legal oversight. But that was an expensive option, and not one Bonten was able to afford. Though, probably worth it just to see the face of the grave digger. "Don't go anywhere, Dave. And hold on to that shovel." 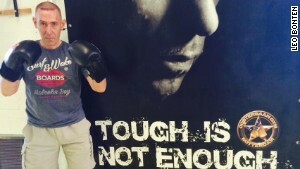 Bonten hopes to return to being an active boxer and runner. Play it, Leo! So, Bonten wouldn't be doing that. There would be no funeral. Still, he wanted his leg, for he had a crazy idea. He would turn it into a lamp. Sort of like the one from Ralphie's house in "A Christmas Story." But real. And significantly more severed. Thus, Bonten and the hospital entered a complicated period of legal negotiations, where they finally came to a mutual agreement after a strange set of circumstances. You see, leading up to his surgery at Erasmus Medical Center, a news reporter gave Bonten a book by Joris van Casteren about a mysterious leg found by a fisherman in the IJssel River. That book led Bonten to a pathologist named Frank van de Goot, who was more than happy to help with all this lamp nonsense. You see, as per his profession, van de Goot was able to legally obtain Bonten's leg from the hospital after surgery. Thus, the leg was then couriered to van de Goot as specified by the law. He would inspect it. He would study it. And, ultimately, he would preserve the leg with chemicals so it could remain ... a leg. Someone still had to make it into a lamp. 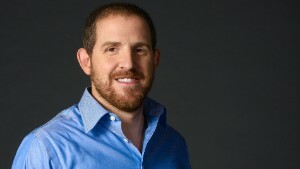 Eventually, as Bonten's story became an even bigger media sensation, a designer named William Schaper Kotter decided to reach out and offer his services to complete the vision. This thing was actually going to happen. And now it's done. They made a lamp out of his leg. Today, the leg sits suspended in a glass cylinder filled with a solution. Surrounding that cylinder are metal bars, symbolizing two years of physical "imprisonment" suffered by Bonten while the leg deteriorated. Above that is an empty space. This represents the rehab period. And on the top sits a large remote-controlled LED light, flanked by two metal wings, honoring Bonten's upcoming freedom from the help of a new limb. Which is where the story takes another twist. The issue of the prosthetic. To be fair, the overall design is pretty amazing. Bonten explained to me that the one he's getting through his insurance is not top of the line. Quite simply, he wants something better. Something stronger. Something more agile. Because, before all this, he played soccer. He ran. He boxed. It was one silly accident that changed everything. But a high-tech prosthetic will cost him. 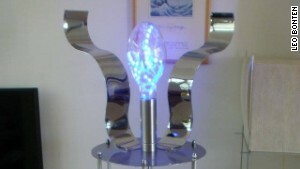 So, he decided to sell his lamp on eBay for €100,000 -- an endeavor that lasted not even two days before the online bidding site rejected his listing. You can't sell human parts on eBay. On the plus side, you CAN sell used socks. Don't ask me why I was looking. Just know that you can. So, until somebody comes to him with an offer, Bonten will just keep it at home, where he just returned after a lengthy stint in rehab. His lamp will arrive on Sunday, and he'll finally be re-united with his leg. "My leg is amputated," he says, fully understanding the humor and absurdity in all this. "But it gives me a good feeling that I still have it." And if he wants to cover the foot with a dirty, used sock ... sadly, I know just the place.